Last month I introduced a wine specialty shop “weinwerk8” in the “Unknown Germany” corner. I received a thank-you email from the owner Stefan Jauch. He thanked me for the article, and said he was happy that I liked the wine. Actually, I overlooked an element of the name of the shop. That is the number “8”, which made me curious later. Why “8” instead of lucky 7? I asked Stefan directly. According to him, “8” stands for infinity. Accidentally, the house number of the shop was also “8”. “Wine and all around the wine and the making of it is my passion. Wine is culture and lifestyle. For me it is very important to know the wine makers (they are all great personalities) and the art of making wine. He tempts me to sip a glass of tasty wine again. 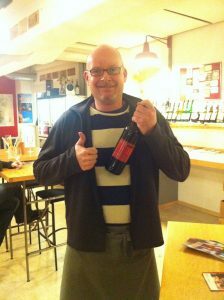 Stefan, please keep making the locals happy with your special wine. And, if our readers happen to visit your shop all the way from Japan, please look after them.